which is well known as unique original design. The tote bag with quilting of metal heart frame and plump heart! You can feel soft texture with plumpness and roundness by a sponge in the main body. Brand logo is also engraved on the metal heart, making you feel more luxurious. The longer handle is enough length even if you wear a jacket. 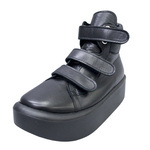 It is the user-friendly size, in consideration of women’s fashion balance. Inside, it arranges a large and small pocket on forward and backward. In the bag which tends to become disorderly, it also has delightful functionality. 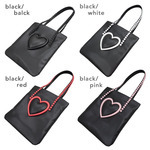 Please enjoy TOKYO BOPPER's lovely heart bag with fashionable strap.